does any company make rear launch springs for a 1998 bird. i called summit and they said they couldnt find any for it. what springs are people using to launch at the strip? any help would be great! I thought I remember seeing somewhere that you can use V6 fbody springs but I am not too sure on that. seems like even of you could figure that out, you would be more prone to snap things. You want to stop the axle from rotating as much as possible. That will give you traction. Try it out. Post this up in the drag section. i used a set off a 5.0 mustang. worked nice but i gave them back..
What exactly is a "drag bar" ? Replaces the rear sway bar. Anti roll bar, that keeps the car level on the launch. I'll check it out -- thanks for the explanation guys! I'll show you the one on Nymph at Spazpalooza...thing is massive. To put it into context, when I pull into my driveway from the right, my left tire leaves the ground going over the hump because the rear end suspension is so stiff. WHAT!! Thats crazy. What brand is it? Im looking to get one soon. Forgot to answer the OP's question. Strano Springs sells the Eibach Drag Spring Kit. It comes with 4 springs and a drag bag for the passenger rear. I run a combo of the Eibach Prokit Springs on the front and the Eibach Drag Springs on the rear. I have yet to install the bag, but that will probably be done while my car is in the shop for the new motor. BMR Xtreme Drag Bar...1.5" diameter. If you do the drag bar, there's no need for the air bag !!! I just thought hat is you used both you would be better off than if only using one or the other. With just the drag bar, my car launched even & level. That's stock rear coil springs too. Does that Extreme bar make the car ride like shizzle? All I need to finish my rear suspension is a drag bar and a torque arm. Thinking of going with the DB next and I drive my car a lot. Not as a daily, but just about every day the weather is nice. how much of a diff. does the drag bar make tho? i have a adjustable panhard bar and lakewood adjustable traction bars and i still can hook with slicks. the launch is even, its just the tires still slip. When you launch, the right rear tire jumps up, and the left pushes down. The rear twist... 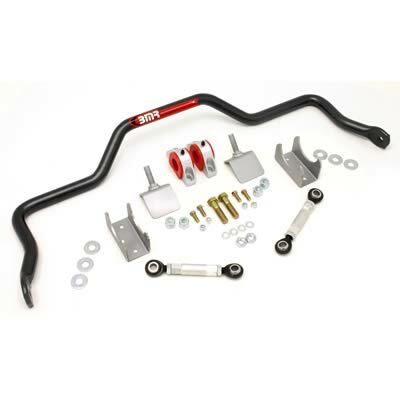 The drag bar is an anti roll bar that keeps the rear from twisting. Plants the tires evenly. I looked up your traction bars. Don't quite understand them. I guess you still have the stock control arms ? If so, I'd still add a set of LCA relocation brackets. How to launch wanting good times but not tearing up the car on launch?